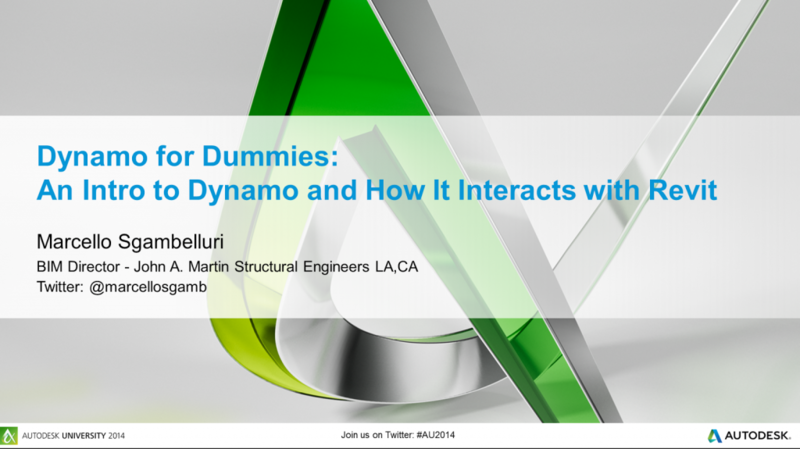 Dynamo For Dummies screencast… interested? I am enjoying using inverted background (black) when working with Revit and point clouds. I find it interesting that we can receive a point cloud (laser scan) of a project, which essentially describes the geometry and colour of the whole 3D space, and yet have to re-model everything in Revit elements to make it actually useful in a BIM / FM context. This post is about my experience working with point clouds and Revit 2013 on a recent project. I explored various different workflows and add-ins. I will add to this post over time to make it as useful as possible. coordinates would be reduced to a consistent XY and Z datum (a Shared Coordinate system that we would use project wide. More detail on how to use point clouds and shared coordinates here). Note 1: I initially had problems using a combination of Revit 2013, Scan to BIM and Leica Cloudworx. For example, Wall Region Grow would report “No points found in this area?” However, if you zoom in and click exactly on a visible point from the Cloudworx point cloud, Scan to BIM should be able to pick it up. A representative of Imaginit / Rand reports that Clients often do use both tools together. 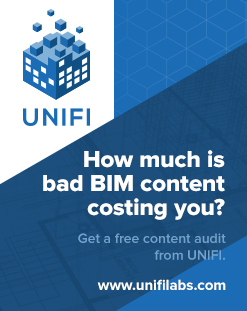 Scan to BIM seems to be the better tool for feature extraction and geometry creation, while Leica Cloudworx puts you in direct contact with the original point cloud data – not decimated by Revit. will take about 7 hours for a mid-range PC. Working with 2 of these 7gb PCG files in Revit 2013 on XP64 with Scan to BIM will consume about 11gb of RAM easily. You may have to periodically close and re-open Revit, depending on your system specs. Working on the same point files using Cloudworx will consume about 2gb of RAM, depending on your view settings. If you are using Revit 2013 and you want to restrict Revit from highlighting (pre selecting) a point cloud, which can be annoying, just place it in a Design Option. 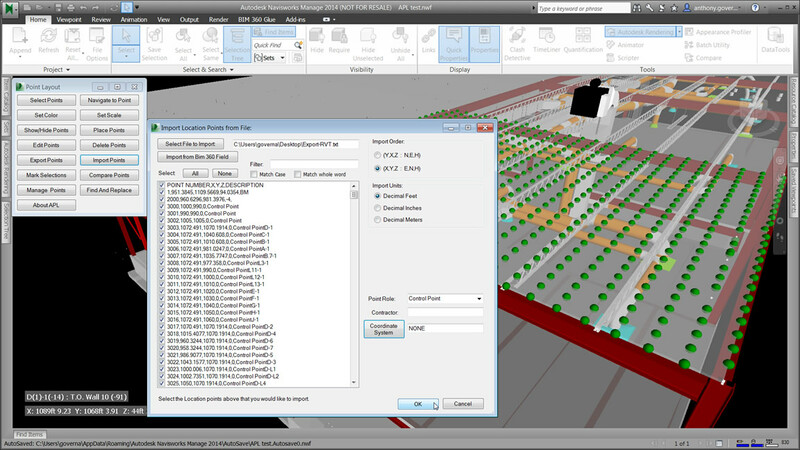 It seems that Scan to BIM can still interact with a Point Cloud in a primary option of an option set. Did you know that Point Clouds when imported to Revit have a Phase Created and a Phase Demolished parameter? Revit respects this when it comes to Phase Filters and Graphic Overrides – keep this in mind if you can’t ‘find’ a point cloud in your project. Set Current View as HomeUsing these shortcuts, you can quickly reorient yourself and use the Viewcube properly. The above workplane shortcuts work well after using the “Set Workplane” tools in the various add-ins. After triggering Orient to a Plan, just click OK. When Revit says -not associated-, it means ‘use the current workplane’. You should also set and use a keyboard shortcut for the Show Workplane button on the Home tab. When making a new 3D view, the quickest way is to select an existing Section Box and copy it using Revit copy (not Ctrl C) and drop it close to new desired location. It will appear in Project Browser with same name as previous 3D view, but with any digit on the end of the view advanced by 1. This is actually better than using Duplicate View, which adds this silly “Copy of” to the front of the new view name. To facilitate setting of a Workplane based on already modelled geometry, I made a simple 3 point adaptive component with a surface formed by these 3 points. You can use Set Workplane to pick this triangulated plane and work from there. You can also access an archive of webcasts by filling out this form. Carving – A quick way to reduce the extent of the wall is to use the Split Tool – rather than trying to find the edge, just Split the wall horizontally or vertically or both, and delete the bit you don’t need. Sloping / Slanted Walls – You can either use the Wall by Face option on the Wall Region Grow tool, or create an inplace wall out of extrusions by using the Set Workplane tool. The latter is preferred if you want to modify the resulting wall in any way. Optionally – use the “Work on Wall” button, Select Wall, and use the resulting section to edit wall profile, add windows etc. The topo creation tools in Scan to BIM work great. You essentially get to pick points, choose decimation, and then you get a topo. Easy, right? Well, then you have to clean it up. Tip – in a 3D view when using the Adjust Slab tool, you may have a better experience if you switch to Wireframe first. This stops model elements from occluding the Analysis Result that shows you the slab deviation. Personally, I find the use of Floors to be a bit more frustrating than that of Topos. It would be nice to have a Floor tool that works essentially the same as the Topo one – select a bunch of points, decimate them heavily, and use them as the top surface of a Floor element. This is a simple two point click. Use “Work on Wall” to make a perpendicular wall section of the hosting wall. Then click one corner and then the other of the glazed area. Adjust mullions according to point cloud. I also had a license error. I had to open Cyclone itself and switch it to VIEWER mode. I ended up receiving a trial license.dat, and put this in the appropriate folder. Add-ins, Import ModelSpace View. Then drill down in the Cyclone database until you find the appropriate view. I found one based on a known coordinate system and it was a ‘unified’ view. You can import multiple point cloud sources. 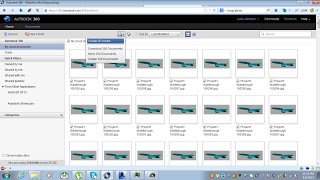 I immediately noticed that navigation (using Revit 2013) was much faster with Cloudworx than with the native PCG files. 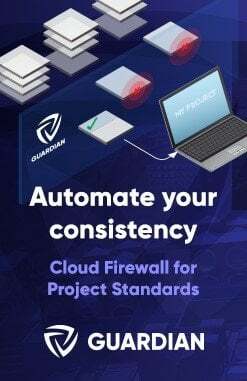 As you zoom in and out, Cloudworx will ‘throw away’ or add points to keep the view relevant to your context (as well as maintaining graphic performance). Use the Rendering options on the Cloudworx ribbon to set your desired view (such as True Colour). When you save the Revit project containing the Cloudworx DB link, you will be prompted to save a .cwprj file. Make sure you do this. After closing and re-opening Revit, the Cloudworx data will be gone. You use the Open option from the Cloudworx add-in to recover your previous work (view links, view settings etc). Cloudworx doesn’t have anywhere near the sophisticated geometry creation tools included in Scan to BIM. However, it does provide a facility for clipping point clouds, visualizing them, saving view states and setting workplanes. In terms of exploring the Point Cloud, it is actually the superior tool. You just can’t make anything “Revit” from it. Description: This class is an in-depth look at the CloudWorx for Revit software. Follow along with the instructors with the supplied database to practice each of the concepts. Items that the class covers are slicing, clipping, limit box, drafting walls, drafting floors, drafting pipes, and many more. Save as PTS file. Optionally, compress to LAS using this workflow. Use a LISP tool like PointsIn or PTSIN to import Point Cloud to a AutoCAD DWG file. Optionally, place a block element at each point to allow easy snapping in Revit. Do your modelling, and save and load your Family into the Project. Recommended – delete the source DWG and purge the Family to decrease overhead. video showing the clipping of points in Recap, then import to AutoCAD using PTSIN, then Import to family environment. This allows creation of component families using point data (alternative method would be to make an in-place family in the project environment and then save to RFA). Using Navis to visualize point clouds? 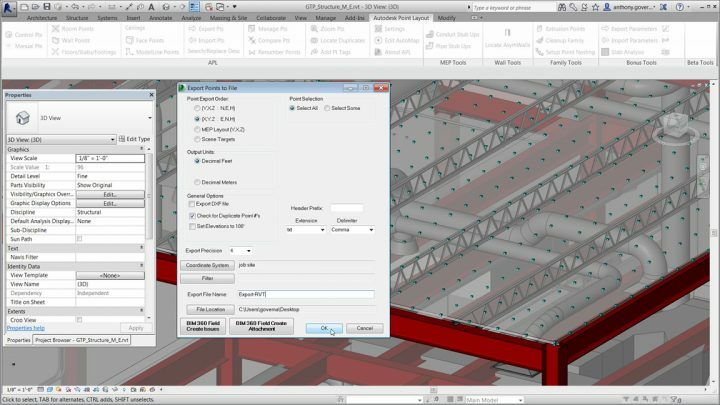 Controlling visibility: Control the visibility of the point cloud on the Imported Categories tab of the Visibility/Graphics Overrides dialog, as well as on a per-element basis. You can switch the visibility of the point cloud on or off, but you cannot change graphical settings, such as Lines, Patterns, or Halftone. Creating geometry: A snapping feature simplifies model creation based on point cloud data. Geometry creation or modification tools in Revit (such as wall, line, grid, rotate, move, etc.) can snap to implicit planar surfaces that are dynamically detected in the point cloud. Revit only detects planes that are perpendicular to the current work plane (in plan, section, or 3D) and only in a small vicinity of the cursor. However, after the work plane is detected, it is used as a global reference until the view is zoomed in or out. PS. Why do I have this feeling that this might be my most visited post this year? For some time, I have been looking for a way to get 3D geometry from any format, make it into a nice, Revit-friendly SAT and then use it in massing or visualizations. Can Memento help me with this? Answer – not really. I realised at this point that you can’t make an RCM file from Recap… What a pain! So, looks like we need to make one using Recap Photo. 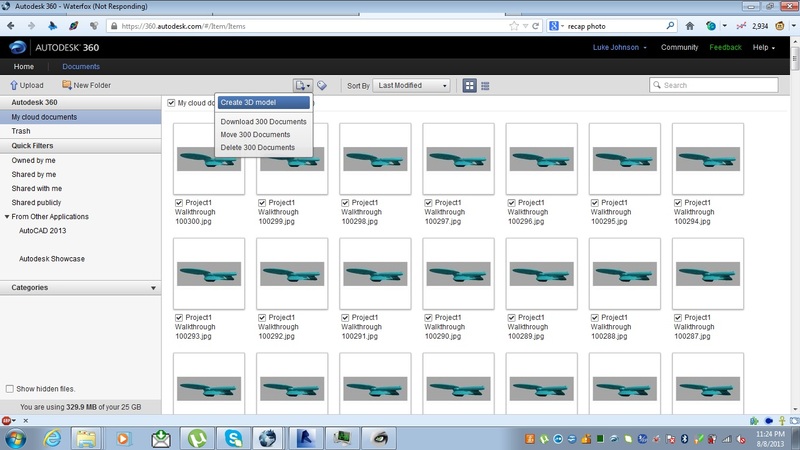 To use Recap Photo, upload some images to Autodesk 360. Now, use Memento to open and edit the OBJ – and try to fix the holes in it. Note: Memento will not run on Windows XP. Have you heard of GreenSpider? The Revit point cloud importer? 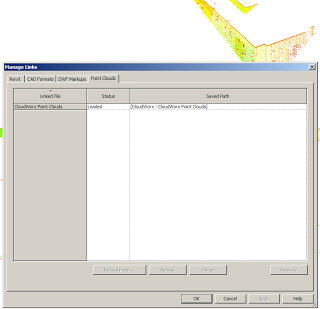 GreenSpider conveniently parses ASCII text files representing 3D vertexes, whether generated by computational modeling software or terrestrial laser scanning equipment. Once installed through this installer package on Windows-based pc’s, GreenSpider 2.1 can be accessed in Revit mass modeling environment. GSpoints and GScurves. The first one simply imports vertex point cloud as reference points in mass modeling environment, while the second traces a spline interpolation among imported points sorted through a TSP process, in order to build surfaces after recursive .GSP imports. Decimated laser scanner point clouds are imported this way in Revit as many times as needed (using a reset function every time in Translator module), and generated curves can be used to originate surfaces very close to their real geometry. #GreenSpider 2.1 for #Revit almost ready to launch. Still some work on Eclipse installer! Point Cloud Projects (*.rcp): Pick an indexed point cloud project file with .rcp extension. An .rcp is an aggregation of multiple .rcs point cloud files. Point Clouds (*.rcs): Pick an indexed point cloud file with .rcs extension. Raw formats: Pick a file with an extension in the list to automatically launch an indexer application that will convert the raw file to an indexed file. 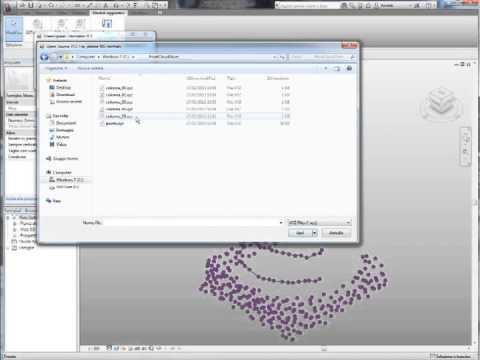 After the indexed file is created, you must use the Point Cloud tool again to insert the file. All Files: Pick a file with any extension. 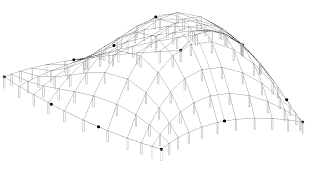 Have you ever been frustrated by Revit when editing the end point of a spline? You try to drag the end point – and instead the entire line gets dragged or scaled! The problem? You need to Tab-select the actual endpoint after selecting the Spline itself. But you know what? Revit seems to give you no visual cues that you have selected the End Control Point rather than the ‘end point of the entire spline’. 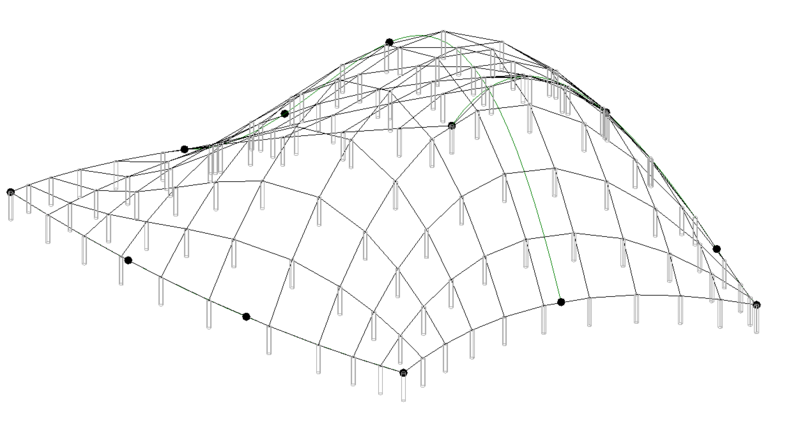 Select the spline, then select and drag one of the spline endpoints. Select the spline, mouse over one of the endpoints, hit Tab, then press and drag the point. Given the big difference between 2) and 3), you would assume that Revit would tell you which one it is going to do, correct? Wrong. The status bar shows the same thing prior to both commands – “Drag Line End”. The tooltip shows the same thing regardless of whether you have pressed Tab or not – “Drag Line End”. If the inner dot is highlighted, Press and Drag will Scale the spline, if the outer ring of the point is highlighted, Press and Drag will move the Control Point only. I think the way this works currently is a bit counter-intuitive. Hopefully it will get cleaned up in a future update or new release. Sometimes you may have trouble using a DWG that contains ‘points’ to create a Revit topography. There are two main ways around this. These points can then be imported when making a Revit topography by selecting ‘Specify Points File’ on the Ribbon. RevitCity.com | Topo point does not import?